RoxArts Council Art Challenge Show in the Library during December. The Art Challenge Show now on view in the Community Room at the Roxborough branch of the Douglas County Library is by members of the RoxArts Council. Local artists were asked to create something in their medium based on the photo above. The photo basis was taken from a deck in Roxborough Park one afternoon this summer . As you can see, the sky was very dramatic on that day. The artists showing their work here all began with this photograph as their inspiration, and then went wherever their instincts, whims, pleasures, creativity took them. That is how we compiled the exhibit you can see in the Community Room. We hope you enjoy the many diverse ways in which the artists responded to the challenge. 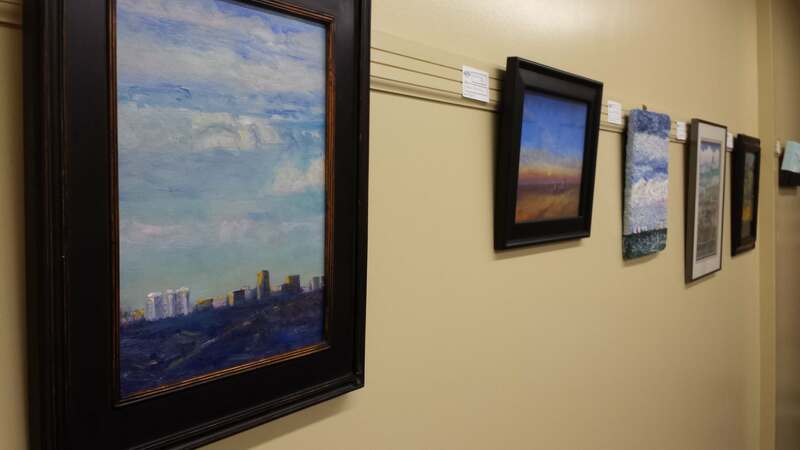 You should be aware that we are all local artist members of Roxborough Arts Council, and our gallery is downstairs in the mall near the tavern. Below is some of the artwork on display.